Description: 11G heads west with 5 units lead by the 7506 with a CEFX unit in the middle. Description: CEFX 2799 adds a little color to the 11G. Description: 11G had a little of this and a little of that. Description: Coming past the Bunge Corp. 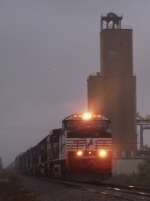 Elevator with 5 NS Units was UP Train MNLAS 16 through a hard rain. Needless to say I grabbed some of my grandpa's rain gear after I took this shot, I was SOAKED! There was quite a variety of NS Power on this train, including NS 9253 which is an Operation Lifesaver 25th Anniversary Locomotive. Description: 2 blobs smoosh a white on 507, heading west over the high line. Description: NS C40-9W 9033 sits at the Cresson Service Center.